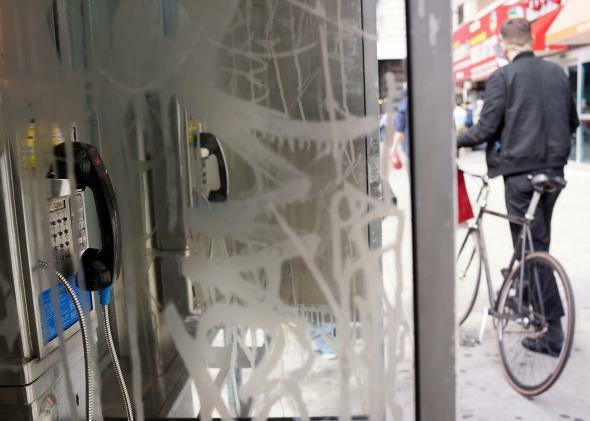 Mayor Bill de Blasio wants to turn New York City's payphones into wi-fi hot spots. New York’s Payphones May Become Free Wi-Fi Hot Spots. For Real This Time. New York City Mayor Bill de Blasio wants to take advantage of the existing infrastructure that is the city’s 9,903 active public payphones. And he wants to use them to make an enormous free, public wi-fi network. Previous administrations have mulled this idea as well, but de Blasio has long-term goals that seem like they will actually happen. In an announcement on Thursday, the city outlined a plan, including a call for proposals, to set things in motion. “By using a historic part of New York’s street fabric, we can significantly enhance public availability of increasingly-vital broadband access, invite new and innovative digital services, and increase revenue to the city—all at absolutely no cost to taxpayers,” de Blasio said in the press release. Where’s the money going to come from? As the New York Times points out, 84 percent of the advertising on city payphones comes from three groups: Van Wagner Kiosk Advertising, Titan Outdoor Communications, and Telebeam Telecommunications Corp. All will be renewing their contracts next year, so it’s a convenient time to renegotiate such that advertising can support the creation and maintenance of the 10,000 hotspots de Blasio wants in the five boroughs. If the plan is executed, New York would have one of the largest wi-fi networks in the United States, and the network could really be a resource for citizens in a city with rising economic inequalities. But it has to happen first.